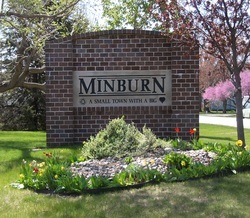 The City of Minburn had been without a mayor since the May 9th resignation of Jordan Lint. However, at their most recent City Council meeting, the City swore in new Mayor Kaleb Sharp. According to City Clerk Kris Fitch, Sharp was the only person to express interest in serving as mayor. They published a Notice of Intent to Appoint and encouraged anyone interested to be at the June 12th meeting. After being sworn in, Sharp oversaw the remainder of the meeting. With the mayor position filled, the City’s attentions now turn to filling the two vacant City Council seats. Daryl Finestead and GayLynn Stajcar announced their resignations at the same time as Lint, and Fitch said another Notice to Appoint has been published. She is hopeful they will be able to appoint two new council members at a special meeting to be held on June 26th. If no one shows up, they will still have until July 3rd to appoint replacements. After that time, they will have a costly special election.